Brown banded cockroaches get their name from the two light bands they have across their dark brownish bodies. The male’s wings are larger than the female’s wings. Brown banded cockroaches often hide their eggs in or under furniture. They usually live 5-6 and a half months. Diet: Brown banded cockroaches prefer to eat starchy foods, such as wallpaper paste and book bindings. Sometimes they’ll eat non-organic things. Habitat: Brown banded cockroaches prefer warmer, drier, and higher locations than most cockroaches. 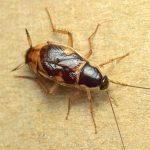 While most cockroaches prefer to live in kitchens and pantries, Brown banded cockroaches will live in any room in the house. They do not need much moisture and avoid light whenever the can.